Mr. Nityam Khosla, Director, TEAMGLOBAL Logistics Pvt. Ltd.
Mr. Percy Vapiwala, CEO, Ameya Logistics Pvt. Ltd. Thank you for the wonderful display and organisation of the 9th Mala 2018 awards. Congrats for the success of the event ! Great show. Thanks for the wonderful event ! The MALA award ceremony was very well conducted. Mr. Ramesh Babu, MD, Seashell Logistics Pvt. Ltd. I appreciate EXIM and Team in organising a wonderful event. These are the events that makes the fraternity and industry to set the Standards up. Good job keep going. Mr. Rahul Joshi, Managing Director, Om Freight Forwarders Pvt. Ltd.
We appreciate the recognition accorded to us at MALA 2018. It was an exhilarating event that was very well organised. Good job. Mr. Sanjeev Mohindru, Jt. Managing Director, EMU Lines Pvt. 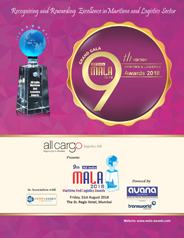 Ltd.
MALA Awards are like Oscar for logistics Industry. Very Impressive!!!! Keep it up MALA and encourage the industry to surpass the achievements every year and post new standards.